When you’re looking for tile flooring in Tampa, FL, you can count on us for variety, quality, and the best overall value. We feature the best brands in the business, and all of our materials come with unbeatable warranties. You receive the five-star treatment from the time you walk in our door to the time you have our pros install your new tile floors. Whether you’re interested in having one room updated or planning wall-to-wall tile throughout your home, you can count on us to keep your best interests at heart. We’ll make sure your new tile floors meet all of your goals. Superior customer service is the hallmark of our flooring store. That includes delivering professional tile floor installation at your home. Every tile flooring installation we perform is backed by our Ultimate Confidence Guarantee, which means if you are not completely satisfied with your floors, we will replace them with a similar product at no cost to you within 30 days of the install. What’s the difference between ceramic and porcelain, anyway? It is true that all porcelain is ceramic, but not all ceramic can be classified as porcelain. Ceramic is made from clays and blown at high temperatures, but porcelain tile is made from finer, more purified clays and is blown at higher temperatures. This results in a material that is harder with smaller pores than conventional ceramic, making it more resistant to water and weight. Both types of tile are great for many similar scenarios, and each offers an outstanding performance in areas with higher moisture content or foot traffic. From kitchens to bathrooms, ceramic tile floors make the perfect addition to any room in your residence. This fashionable and practical material is popular with homeowners and interior designers everywhere due to its natural look and distinctive designs. No matter what pattern you are looking for, we help you find the right option to fit your décor. 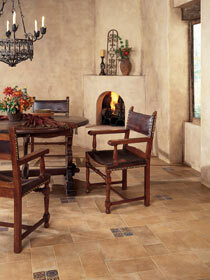 Ceramic tile is available in a wide variety of colors, sizes, shapes, and finishes for a price that fits any budget. When you are choosing a new material for your home, it is important to consider your lifestyle. Due to its durability against regular wear and tear, ceramic is an ideal choice for those with children or pets. It is easy to clean and care for, making it perfect for busy singletons and families. Enjoy great design flexibility when you choose porcelain, ceramic, or slate tile. These floors come in a variety of colors and complex designs, allowing homeowners freedom that simply isn’t available with other materials. Thanks to modern imaging technologies, ceramic and porcelain tiles can be made to mimic a variety of other building materials, including hardwood and natural stone. Shop the stunning collections of ceramic tile at our showroom. This flooring is ideal for any room of a home based on its durability, longevity, and design flexibility. Maintenance is a breeze, as all that’s typically needed is sweeping and mopping. If you’re looking for a classic flooring material that will never go out of style, choose the natural elegance of slate tile. As the name implies, this tile is a natural stone flooring that is mined underground, and possesses all-natural qualities that are tough to replicate. Colors and designs might be limited, but slate more than makes up for it with its enduring appeal and longevity. When you install slate in your home, you may never need to install another floor again, because it’s not uncommon for slate to last more than 100 years. This gives slate unequaled resale value and return on investment. As durable as slate is, though, it’s a bit tricky to install, so you’ll want to make sure you choose our experienced floor installers to tackle your project. Ensure your project goes off without a hitch when you trust us with your tile flooring installation. Our experienced professionals are fully licensed, bonded, and insured, giving you peace of mind that your project is done right the first time. We work hard to complete your projects on time, and make sure to treat you and your property with the respect you deserve. Expect quality workmanship, attention to detail, and the best value on your new floors. With all of the material options on the market, it can be difficult to know where to start on your selection. Luckily, our flooring specialists are prepared to assist you with the decision-making process. We guide you every step of the way—from selection to installation. From your lifestyle to the colors of your walls, we show you how to consider a range of factors that could affect the value and appeal of your new flooring. We help you pick out the perfect patterns and materials for your tile flooring to create the exact look you want. With us on your side, you'll bring luxury home without spending a high-end price. Updating your floors is an easy and affordable way to create a stunning new look in any room. While many homeowners believe they can install their tiles quickly and effortlessly, it is a job best left to the professionals. Our knowledgeable and experienced team will perform a complete installation in any room. We follow your exact layout plans and ensure a result that looks great and lasts for many years to come. Contact us for any questions you have about our tile flooring selection. We proudly serve home and business owners from Tampa, Florida, and the surrounding area, including Brandon, Carrollwood, Lutz, Ybor City, and more.